“I treat artwork as a competitive sport,” said Ethan Murrow, competing against himself in the studio, setting the bar high to advance his work. 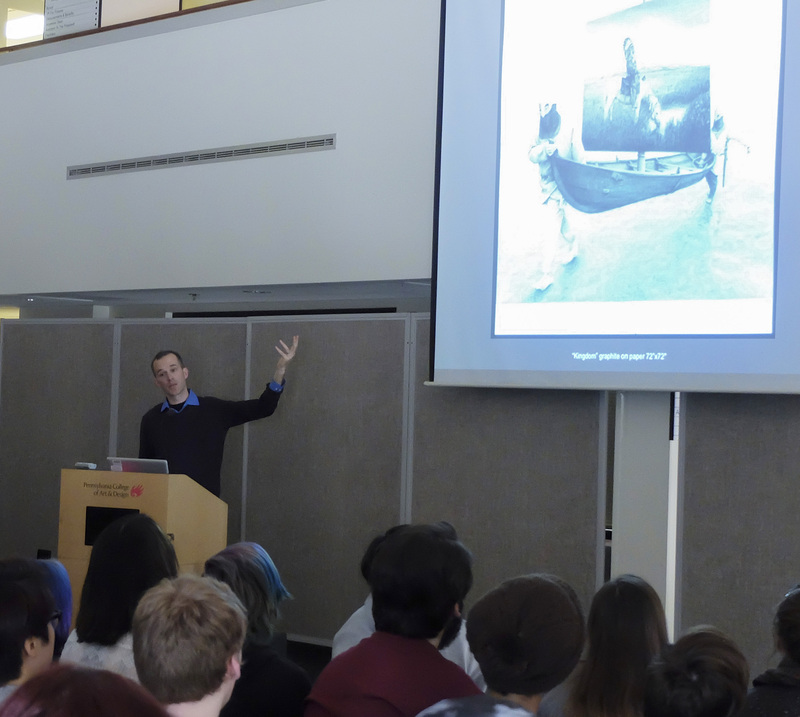 Murrow, internationally known artist from Boston, visited Pennsylvania College of Art & Design Tuesday to present an Artist Talk to a packed Atrium. Following his presentation, he spent time with each of PCA&D's fine art seniors in their Senior Studios to discuss their thesis work. Ethan Murrow received his B.A. from Carleton College and his M.F.A from The University of North Carolina, Chapel Hill. Recent and upcoming solo shows of drawings, video and sculpture include La Galerie Particulière in Paris and Brussels, Slete Gallery in Los Angeles, Winston Wachter Fine Art in New York City and Seattle and the Nevada Museum of Art. Ethan recently participated as Artist in residence at Facebook, was included in the DeCorodva Museum’s 2013 Biennial with a three story wall drawing and had a solo museum show at the Clay Center for the Arts and Sciences. In the summer of 2015 he was a fellow at the Ballinglen Foundation in Ireland. His work is in many public, private and corporate collections and has been reviewed and published widely around the world. A monograph on his work was produced in 2015 by the German publisher Hatje Cantz. His film project “Dust” with Harvest Films and wife Vita Weinstein Murrow was an official selection of the 2008 New York Film Festival. The Murrow’s will also be publishing their first children’s book, “The Whale” due out fall of 2015 in Europe with Big Picture Press and in the the USA winter 2016 with Candlewick Press. Murrow serves on the Graduate and Painting Faculty at the School of the Museum of Fine Arts, Boston.